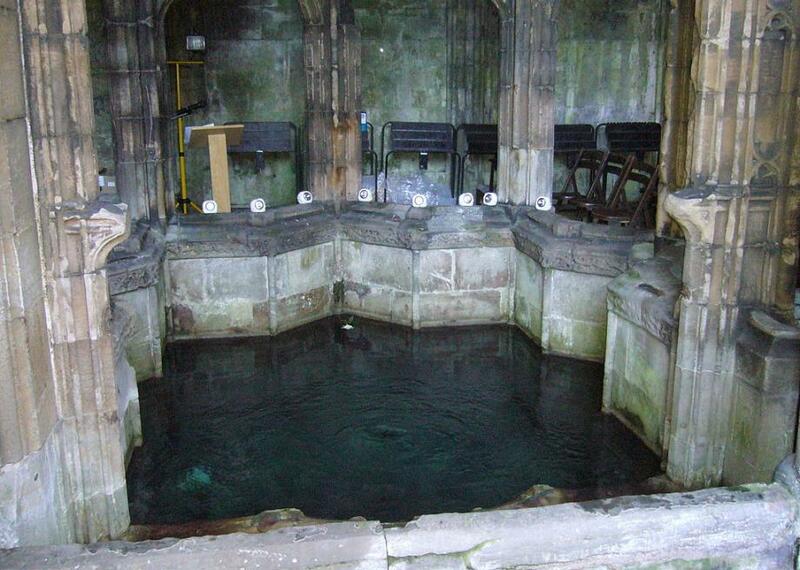 Winifred’s Well in Holywell, Wales, is said to have been created by a beheading. The source of Winifred’s Well. As the story goes, Winifred, daughter of a wealthy Wales citizen and sister of fellow Saint Beuno, was being romantically pursued by a man named Caradog. Winifred was not interested in the man’s advances, and when she finally refused to lay with him, Caradog lopped the young woman’s head off. Where her head hit the ground, a natural spring instantly sprung. Poor Winifred was thankfully resurrected thanks to the saintly prayers of her brother, but the spring remained. Pilgrims who visited the miraculous spring claimed that the waters healed any number of ailments, and a proper structure was built around the site sometime in the 12th century. While the aging medieval chapel still covers the bubbling well waters, the site has added a shallow wading pool in the courtyard that is filled directly from the well. Visitors can actually bathe in the holy waters and towel off in the innocuous cabanas. Despite a violent origin, Winifred’s Well is peaceful site that allows for relaxation that might be more healing than the magic waters.